Ben calls in with an update on the first push to C1 and C2. When you are done listening please read here for a full written dispatch and loads of images from today! FTA Broad Peak 2012 - C1 tonight! Our team is moving up the hill for the first time to spend the night today so its an exciting time! They have made a few trips onto the hill with acclimatization runs and load carries and now they begin to live on the slopes of the 12th highest peak in the world. Over the next few days everyone will get some high sleep time and with good luck and good weather they will all be in C2 in the next 4-5 days! Brad continues to give us nice insight into the daily happenings so read on and enjoy! June 25t - First trip up the mountain. Base camp to Camp 1. Breakfast was at 4am and we headed off at 5am for our first trip to Camp 1. 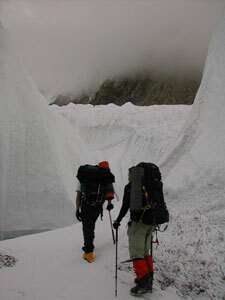 We weaved through the seracs and glacier to the scree slope at the base of the climb. Conditions were reasonably warm but cloudy and a thin layer of snow made footwork difficult with our HA boots. The start of the route is approximately a 40° slope and we put on our helmets, harness and crampons. Almost immediately we encountered a rock band, which proved surprisingly tricky. I slipped and was rewarded with a fat lip for my troubles as my jumar caught and I face planted on the back of my hand. The climb to camp 1 took 4-5 hours with Louis leading the pack up the hill. The slopes were consistently 30-45° and just prior to camp1, we really had to work hard as we plunged up to our knees to waists in certain areas. At camp1 we didn’t stick around that long as the weather was inclement with intermittent snow showers. Was a successful day as between us we managed to get 10 tents to camp 1. Camp 1 has limited space though so we are not sure whether we can set up tents for all the team or split the team up and do some rotations. Coming back down from Camp 1 was a question of a lot of arm rappels with one abseil/rappel on the rocky band. Attached is a pic of Matt, at the top the abseil. Once back at crampon point, we shunted of our technical gear and tried to make our way back through the maze of the glacier. We all didn’t realize how long it took to weave our way back through the glacier which looked quite different as the morning’s thin layer of snow had melted. We were all pretty much back at base camp by 1pm, so a nice 8 hour day on the mountain. One team member had a problem with a headache, still acclimatizing to the altitude but overall a very successful excursion and really great to be on the mountain. 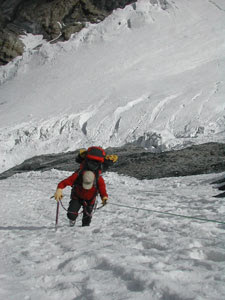 We had left Islamabad on the 8th June, so had taken us a while to start climbing. A few sore muscles and tired limbs today. Was nice to have breakfast at 8am. Unfortunately I had my first GI incident last night around midnight, so I spent much of the wee hours of the morning, awaiting to evacuate my tent but luckily everything was controllable. Today, marked the day of the arrival of the 9th person of our team with Grace from Toronto arriving at camp. Grace has had an incredibly hectic schedule since arriving in Karrachi on the 19th June , and has made her way to base camp skipping several of the stops that the rest of us made to get here. Weather here at base camp has been incredibly inconsistent with brief rays of sunshine immediately followed by snow showers. We are still deliberating on whether we go back to Camp 1 tomorrow but looks highly likely we will wait for the slopes of Broad Peak to stabilize from recent snow and head up on the 28th June. Mat managed to fit into a shower much to the benefit of his ‘morale’. Arnie, Daren, Louis and Ben finally bought out the pack of cards and got stuck into‘Contract’. Today we made plans for our first real rotation up the hill. 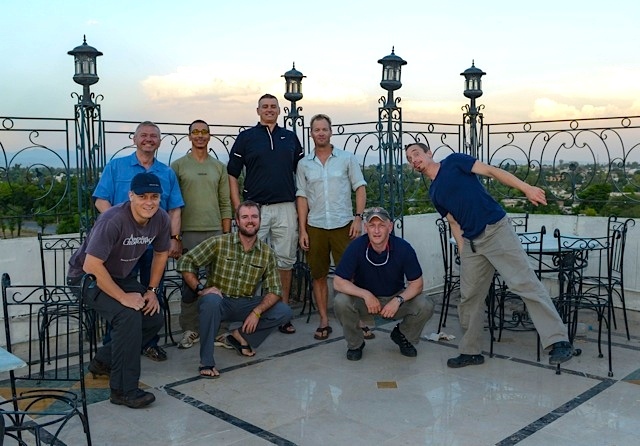 Al, Matt and I plus the four HAP Said, Tacqui, Aziz and Mahadi will depart tomorrow for Camp 1, set up tents and sleep. The following day, we will help the HAP’s fix the lines to Camp 2. The rest of the gang Ben, Darren, Arnie, Louis, Grace and Hamza will follow up on the following day and then on their next day will carry up tents to Camp 2. After this rotation we should have sufficient tents at camp 2for all members to climb direct to camp 2 in one group. So aside planning, pretty much a lazy day as we took advantage of the first clear day in quite some time and dried sleeping bags and charged up our Goal0 devices. Frederick and Ernie the Swedish/Lithuanian duo popped over for a visit and Ben and Louis wentjust below Camp 1 to drop off some fixed rope. Our team has made their way to their home for the next month at the base of Broad Peak. The members have been making it as comfortable as possible despite the fact that it is a rock and boulder covered moving glacier! After two days of acclimatizing, practicing fixed rope and ice climbing skills and sorting gear they have made their first foray onto the slopes of Broad Peak hoping to make carries to Camp 1. Ben dropped us an audio dispatch yesterday which you can listen to here. It will be interesting to hear the difference in his voice as the trip goes on. Usually crisp and clean in Skardu and pretty hoarse by the time we are done! We do our audio dispatches using ipadio which has been a fantastic resource for us over the past few years. It is quite a thing for our teams in the field to be able to simply dial a number and leave a voice dispatch that shows up without any delay on our site allowing real time communication with family, friends and followers. If you are looking about for a way to send out audio dispatches from cell phones & sat phones when you are off on a trip or expedition, we can highly recommend them. Brad has continued to write daily notes and here are the last few days to catch you up along with some nice images...enjoy! June 19 - A long day to Udukas. We left reasonably early at 06:00am and didn't arrive till 3 pm due to helping someone who has been weakened due to GI issues. This was the longest day of the trek and we had to make sure our water lasted the day. A big plug for the Camelbak All Clear as I just scooped up water from the glacial streams and UV filtered for 60 seconds. The campsite at Urdukas was dirty but we had a wonderful view over Cathedral and Citdael Peaks and Trango tower. We also had our first view of Broad Peak. Ben called me out of the tent to take pics. Matt, Darren, Ben and I spent quite some time watching the changing hues of the alpenglow on our intended mountain. Today was the day the absolute silence of the Baltoro was shattered by a pair of Mirages flying low and fast down the glacier. My first thoughts was of a massive avalanche as a piercing scream sounded ahead of us before screeching overhead. The Pakistani Air Force Mirage flyby was actually a gift from our liason officer Zeshan, who has requested a fly by while we were organizing our gear in Skardu. Even he was quite amazed at how low the fly by was, with estimates at less than 100 m above us. 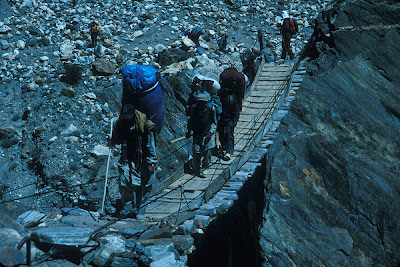 The most wonderful hike of the trek in to base camp. We weaved through penitentes and ice sculptures underneath Masherbrum, Mustagh tower and Mitre peak. The route was more undulating with out the steepness that the glacier had shown in previous days. Robbo and I stopped to do some impromptu interviews/discussions as we had a lot more energy and the scenery energized us more than the previous days. As we approached Concordia, skirting the striking Mitre peak, I just knew K2 was looming around the corner. Once K2 revealed herself about 100m from Concordia we stopped again and took photos of an almost completely cloudless 8,611 m mountain. The Abruzzi, the Cessen, the shoulder were all on display. I had read that complete views of K2 were rare, so was quite amazed to see her naked on my first visit. On arrival at base camp, I was just in photography frenzy, taking pics and videos of K2, G4 and Mitre peak. The afternoon light was simply perfect. Snow fell over night and we woke to a different landscape. Ben and Sayed left camp about an hour ahead of the main group to scout out the best place for base camp. 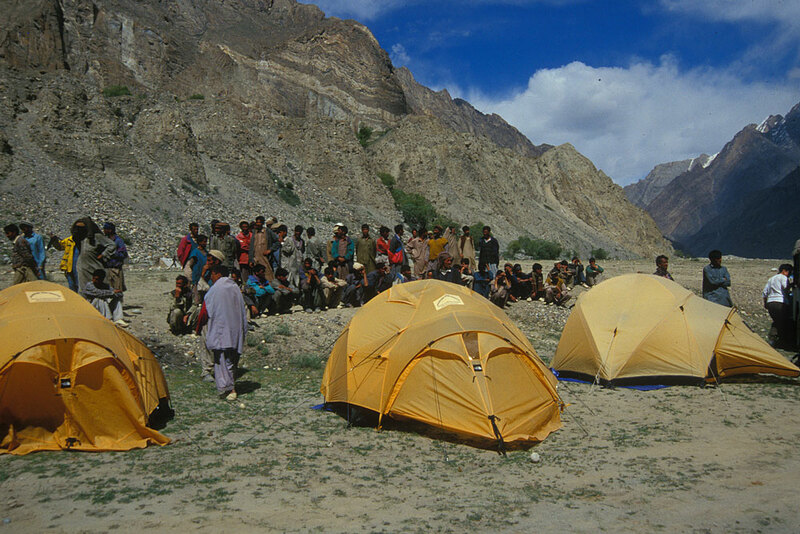 An amusing story from a previous year, a keen member raced to base camp ahead of the porters and stopped at a scenic place. The porters caught up to him and dropped all the gear ignoring the fact that they were probably an hour out from the actual start of the route. 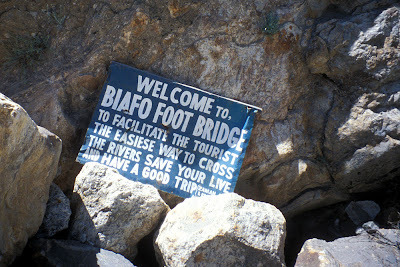 For that particular expedition, all excursions to and from the route meant an additional hour to and from base camp. The light snow across crevasses meant the start of the trip to base camp was slow and many of the mountains were covered except the summit of K2 often coming into view. 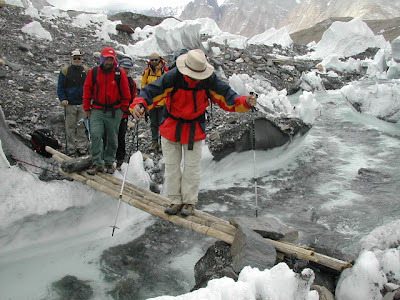 At one stage, a piece of black Pakistani army communication cable was used as fixed rope to help us and the porters descend a particular steep part of the glacier. The remainder of the walk to base camp had Broad peak covered and K2 looming directly ahead of us. Our tent platforms consisted of placing rock on glacier and filling with gravel to build ourselves above the glacier and mitigate the effect of water running beneath our tents as summer changes the glacier. I had brought my personal Hilleberg Nammatj GT, which has almost twice the space of a TNF VE-25, so spent considerable time making a flat space. Realistically I was having as much fun as a getting a new Lego set at Christmas, as I sorted out rocks to get the perfect platform. The afternoon sun burnt of the clouds on Broad Peak and we had our first chance to survey the route. Broad Peak summit is very very close to base camp, much closer than I have seen on Cho Oyu and Everest. I could be wrong but the vertical and horizontal distance seems very similar, definitely no long approaches. Robbo and I were also surprised at the apparent steepness of the route but we were hoping that the fact that we were looking at the route head on may have distorted our perception on steepness. A wonderful sleep in as breakfast was at 8am. We had all been dreaming of base camp and our single tents and I think we all slept well without our tent partners. Today is an active rest day as we sorted through gear, charged up devices and had a cooking stove school. An ominous rumble in the afternoon and looking up at broad peak we see an avalanche roll down the face. We noted with interest the path of the avalanche and hope we can weave a path up the mountain out of the main avalanche routes. Ben calls in from base camp with the latest update! Ben checks in from Concordia with updates on great views to Broad Peak, K2, Gasherbrum IV and more! Can't see this on Ipad/Iphone etc? FTA Broad Peak 2012 - On the Baltoro! They are beginning to feel the altitude with Jhula at 3100m and Paiju at some 3500m. The rest day is helpful to make the larger height gain to Urdukas (4150m) safer and more comfortable. As well the rest day is when the porters prepare themselves for the less hospitable days ahead and cook fresh meat to last the trip up to base camp and back. 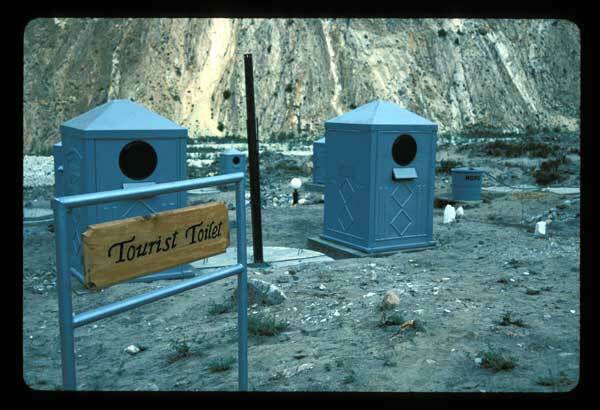 A number of goats who had been ambling along with the members and porters were really only along for a one-way trip. The river runs red for a while and then the smell of goat on the BBQ fills the area followed by one of the best meals of the trip. There is usually a pretty good dance party in the evening as well! The porters all carry approximately 25kg's of team gear plus 5-10kg of their own and typically the same porter will carry the same load each day so members become quite familiar with the porters responsible for their personal loads. The porters efforts are immensely appreciated and without them our expedition would not be possible. For the most part they have strong frames which enable them to strap nearly any kind of object on from expedition barrels to kerosene stoves. 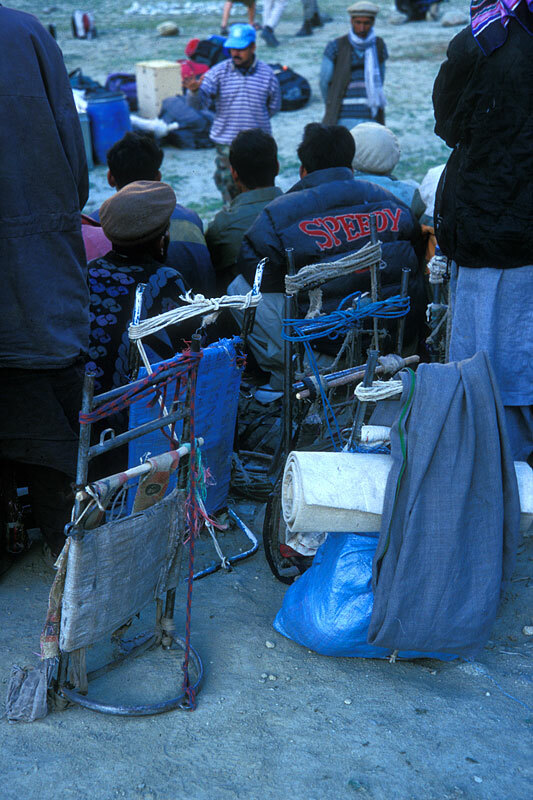 It is quite a site to see 100 to 200 porters all in a row making their way across the vast expanses of the Karakoram punctuated by at least a few with tall stacks of chairs sticking up into the sky. During the course of the expedition we will have a number of extra loads of fresh food brought in and by the time our group is done well over 200 porter loads will have made their way up the 80km long glacier to support our endeavors. Brad's dispatches for the 16th to 18th June are below and hope you enjoy them! Wake up was at 4:30 AM and breakfast at 5 AM. Loaded up all the porters and headed off at 7 AM after taking some videos and pics of the porters taking their loads one by one. Headed off on the road and made the mistake of trying to take a photo of a bunch of three women carrying bushes. One cried "no photo" and under-arm threw a rock at me. Ben had a similar incident when was taking a mountain pic, three "bushes" whirled around and shouted "no photo". These bushes are women carrying large loads of hay twice the size of themselves back to Askole. The first half of the 5-hour walk I was basically by myself but eventually caught up to Darren, Al, Arnie and Hamza at an idyllic bend of the river covered in trees. We did some impromptu interviews after a quick snack and then continued. We traveled along some interesting ridgelines along a braided river and we walked in roughly low 30s heat. My Pakistan warm weather attire was perfect and fell comfortable in the heat though my pack was reasonably heavy. I guess running in Indonesia helps with handling high temperatures. Some of my more northerly members suffered a bit more but we all managed to make it into Juhla camp in a very quick 4 to 5 hours. We were expecting 6 to 8 hours, so once again a pleasant surprise to come in early. The campsite has a phalanx of toilets that look like some kind of fortification, totally at odds with the surrounding environment. Rumor states that these toilets are part of a multi million Balti aid development package headed by former Presidents Musharraf’s daughter. The toilets were built and the rest of the money used to buy a nice living in London. Well, that's how the rumor goes. Another early morning breakfast and another early start as we try and escape the Pakistan summer heat. The day is similar to the previous except more undulating with every hour the mountains become more extreme. At this stage, I am worried about using up my repertoire of adjectives to describe the mountain-scape so early in the trip. Robbo and I took a more leisurely pace than the day prior and I must admit I found it a bit harder, as my backpack seemed heavier and the air more still. We had a good rest at the 3-hour mark and did some interviews and general shenanigans while bemused porters looked on. The second half of the trip to Paiju revealed the awesome lines of Citidel Peak. A peak that looks like it was drawn by a 10-year-old with a ruler. Extremely jagged sharks tooth peaks that hopefully will appear in a few upcoming pics. We all made the lovely tree-lined escarpment of Paiju 6 to 6.5 hours and looked forward to a rest day to catch up on some washing and, considering this is a 2012 expedition, the charging of our myriad of electronic devices. In the afternoon I found a prime location overlooking Cathedral and Citadel Peaks and with the help of some eager Balti porters took some pics. I also took some group pics but unfortunately Hamza that was out walking so we had to reschedule our photo shoot again for the next day. Dinner was an absolute feast with the continued presence of fresh mango as dessert making all of us extremely happy. Today was a lazy day for most of us except for Ben and Louis, who scrambled 400 m above camp to get some glimpses of K2 and Broad Peak. The rest of us rinsed our clothes of sweat and dust and I went on a charging frenzy as I got out all our Goal Zero stuff and laid out solar panel blanket in front of my tent. We managed to rustle up Hamza for the group photo shot and had some very tender goat for dinner. Early to bed tonight as we have an early 4 AM wake up for an early departure for next on the glacier. Bencalls in with an update that all is well in Urdukas! FTA Broad Peak 2012 - In Askole! Our entire team of some 15 are assembled in one of the last inhabited place en route to K2 and Broad Peak. They pulled into Askole after a 6 hour bone-jarring, roller-coaster hours in 4x4 jeeps passing through the last of the small towns and villages they will see for 7 weeks or more. Surrounded by tons of climbing gear, personal gear, food, fuel, solar panels, portable power sources, oxygen bottles gear and more they are having their final sleep before heading towards their 8000m objectives. Accompanied by an entourage of 100+ porters, our 8 western climbers, 4 Pakistani HAPs, cook staff and BC manager will spend the next week working their way along the roaring silty waters of the Braldu River, onto the Baltoro glacier, to Concordia and finally onto the Godwin-Austen Glacier. During this part of the journey they will pass by a treasure trove of mountaineering history including Paiju Peak, Masherbrum, the Nameless Tower, The Muztag Tower, Chogalisa, Mitre Peak, Gasherbrum IV, Angel Peak. Turning left at Concordia they will see K2 and Broad Peak soar above them and gain for the first time a true sense of the scale of the endeavor. 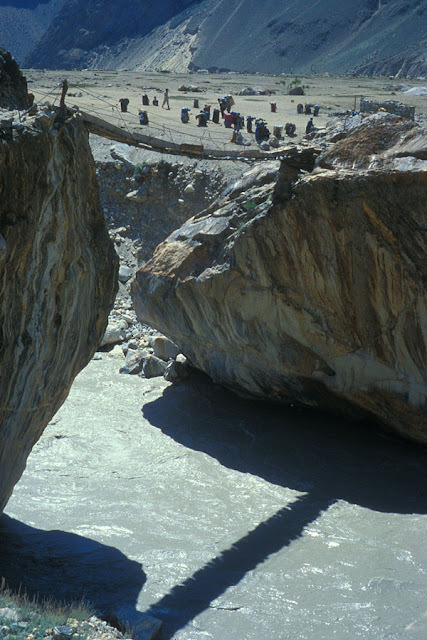 Tomorrow they will begin the 6-8 hour hike to Jhula and will get a very early start to avoid the heat of the day. The first few days can easily see temperatures in excess of 35°C so its nice to get as much done as possible in the cool morning light. Hopefully Brad will be able to send us notes each day and here is his latest from tonight! 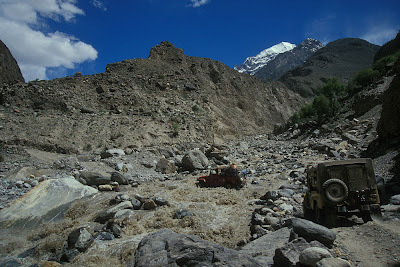 Today was our much-feared jeep drive to Askole. We started the journey half seriously asking the cost of a Russian helicopter. Bracing the worst, we were collectively surprised at the relatively short 6-hour journey. Yes, the precipices were deadly and there were the expected harrowing views down to the raging river below but, due to our terrified expectations, the journey seemed relatively mild in comparison. In retrospect, the journey was comparatively mild due to the collective skills of our two drivers. Negotiating extreme conditions with consummate skill, they pulled off some extraordinary driving with effortless panache. Our jeep is labeled "Act of Cod" and ode to an ocean going fish? We are not sure. Due to ongoing issues with Arni's Icelandic passport, we departed at 11 AM and reached a small village at approximately 2:30 PM. There we stopped for a delightful one hour lunch with rice and chicken curry before carrying on with the extremely bumpy second half of the journey to Askole. This is a beautiful village surrounded by snow-capped mountains and an amazing rock face which one could spend weeks climbing different routes. We are now in the VE-25 tents and the expedition has started in earnest. We have met our kitchen and support staff and we are waking up tomorrow at 4:30 AM. Hopefully Arni will arrive here at 10 PM this evening. That our group is enjoying their first night under the stars has occurred not by chance. Climbing expeditions in Pakistan are not possible to arrange beginning just a few weeks before leaving as is possible in many places like Nepal, Ecuador, Argentina and so forth. Pakistan, more like India and Tibet, requires a great local ground team, lot of documents, an early start and finally patience. an 6 months ago and have been emailing, faxing and calling embassies from Australia and Singapore to Canada, the UK and Oman. Over the years we have come to know the idiosyncrasies of the different consulates and embassies and have gained considerable skill in being able to provide each one just what it needs. Nonetheless the members themselves have been very determined and some have had to make multiple visits to nudge along the process. Oddly enough for some members it required little more than the application with a nice note from our local staff. In other cases members had to provide letters from employers and banking documents and we have had to provide full permit documentation, a police security clearance - which is often not available until just a few weeks from the trip start. Kudos to Hamza and Matt for having the most faith that it would all work out as they only received their final visas at the end of May...phew! In an bizarre twist, given that Icelanders do not need an entry visa, Arni had some challenges after arriving to be allowed to enter the trekking area as it is a restricted military zone. 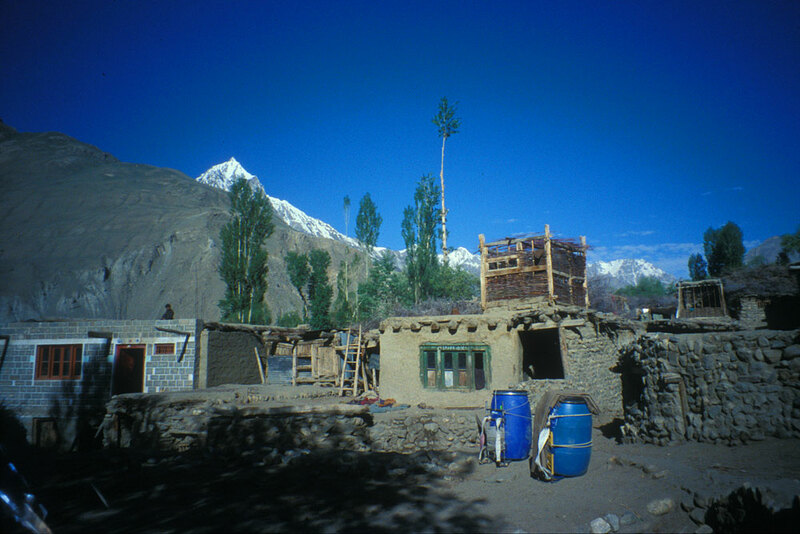 Thanks to some "energetic" conversations (over several days) our local staff had both in Skardu and in Islamabad, Arni's situation was resolved with only a minor delay of a few hours. 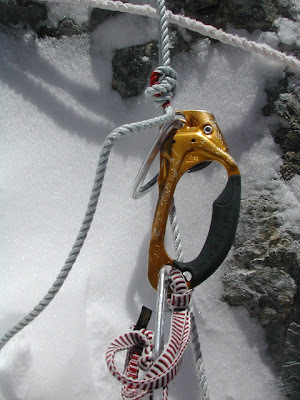 We are sorry that the visa and permit process is so challenging as it makes it less possible for companies unable to commit the necessary support for visas to bring more climbers and trekkers to support the local economy. We have many friends in Baltistan whose lives are impacted dramatically by the good work our teams provide. At least a few teams were unable to run the bureaucratic gauntlet this season and have cancelled planned trips which is a loss for everyone involved. Some day the process will not be so complicated but in the meantime we look forward to taking on the consulates and embassies for many years to come! We'll be back at it for our team to Spantik this August (spaces still!) and again next summer when we hope to return to Broad Peak, G2, K2, K2 Base Camp, Spantik, Snow Lake and Nanga Parbat. Join us! Our team has been enjoying a few great days in Skardu getting the gear ready, eating a ton of great local food, making final purchased for the hill and taking some well needed walks and hikes. They are already feeling the change in altitude and officially beginning the acclimatization process. At just about 2500m/8000ft Skardu is a great place to being adding red blood cells and raising the hematacrit level! Unlike some other places where one achieves a rapid ascent by flying in to Lukla or Quito, the altitude profile is much nicer in Pakistan and it is very rare for anyone to suffer from AMS on the trek to base camp. With good luck tomorrow morning they will be off to Askole and begin the trip in earnest. We are awaiting one last permission from the authorities to allow us to proceed into the militarily restricted zone where Broad Peak, Gasherbrum 2 and K2 are located. There are a very few countries that do not need to go through the visa process to come to Pakistan and this includes Iceland. The consequence is that Icelanders also don't get an official visa stamp of any kind in the passport so the authorities here have had to do a bit more homework to sort out Arni's exact status! Brad has all the news fit and unfit to print from the last few days - enjoy! FTA Broad Peak 2012 - KKH here we come! Despite homing to take the smooth short way to Skardu our team has had to take the rough, bumpy and long one instead! With flights being delayed and the wait list extensive our team had no option but to get going by minibus to Skardu and will be enjoying the Karakoram Highway up close and personal. Our team is already half way to Skardu having reached Chilas a short time ago. Ben called in to let us know all is well and they were glad to be in after a long 16hr day. He said the road was in quite good shape and overall the day was a "piece of cake" which is Ben's understated way of saying their backs ache and they are hungry! As promised this is the second and final test of the audio dispatches and only good stuff to come the rest of the way! We do have the word that our team will be either hopping on the plane to Skardu or beginning the drive shortly and if they have to drive it will mean a 2-day cruise on the awesome Karakoram Highway! One of those drives that everyone should do once if they can. Much like the drive to Lhasa from Kathmandu or perhaps even the ride from La Paz to Lago Titicaca. Loads of crazy turns, great views, steep drops to the rivers below and all in all a great introduction to Pakistan. It will also give our team two days to talk and scheme and get to know each other and begin to build a good team spirit of resolve in the face of challenge. Upcoming trips - Spantik, Stok Kangri, Kang Yatse, Satopanth, Khumbu Peaks and Passes, Ama Dablam, Aconcagua, Ecuador Volcanoes, Kilimanjaro and more! 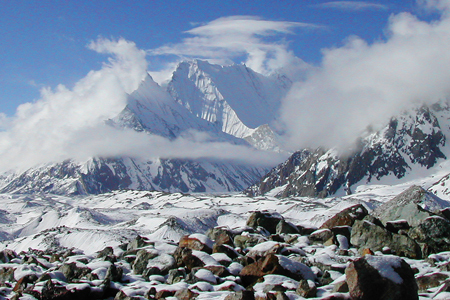 • We have a confirmed Spantik (7027m) for August here in Pakistan and have room for a few more. • On top of that we have expeditions to India in Sept to Stok Kangri & Kang Yatse and Satopanth which need just a few more to confirm them. • Farther ahead we have a confirmed Oct 1 Khumbu Peaks and Passes (including Island Peak, Lobuche E and Pokalde) with limited spaces and a confirmed Nov 4 Ama Dablam expedition. This will mark our 8th straight year fielding teams for Ama Dablam and we'll hope for an 8th straight year with summits as well! • Aconcagua trips in December, January and February - We are already taking applications for our trips to the highest peak in the Americas for climbs on the Polish Glacier and by the False Polish Traverse. We offer custom trips by the Normal route as well so let us know how we can help! We have a full offering of trips for the year ahead and are already preparing for a return to Pakistan with Gasherbrums, Broad Peak, K2, Spantik, K2 BC treks and more for 2013. Follow along this year and join us next season! Mobile Device users: Please note Ipadio is flash-based so you may not be able to hear them here on your mobile devices like Iphones and Ipads. We are looking for a fix and hope to have one shortly! Our team has now assembled in Islamabad and they are making final preparations before leaving for Skardu. Part of this prep includes a good test of the audio dispatches to come during the expedition. You can hear below our first of two tests (from different phones!) from Ben on a super hot day on the roof of our hote in Islamabad. No doubt that with temperatures hovering at about 40°C / 104°F the team is enjoying the cool of the markets and restaurants as much as they can. Brad has written up a dispatch which we'll post shortly so stay tuned! "This is Ben calling you from the roof top of Envoy Continental in Islamabad. Testing the Ipadio dispatch for Broad Peak 2012. Brad's with me here and it's a lovely hot day here. Probably 46 degrees celsius and I'm feeling it out here testing the solar gear, testing the sat phone. It's 40 degrees on the dot! Alright, cheers guys, over and out"